2. 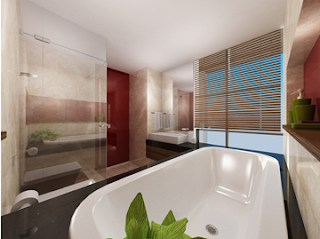 Spatial layout of bathroom: shower and toilet areas should be clearly divided. If it cannot be divided you should also show clearly separate between them in the design process. For example, you can use blinds or partitions to separate them. The lavabo should be arranged in the independent sector or the area outside of the toilets if possible. The distance between toilet seat and two side walls of at least 0.3 meters, between the toilet seat and the front wall of at least 0.4 meters and between the toilet seat and toilet paper containers not exceeding 0.6 meters. The drainage of the bathroom should also be noted. The bathroom stereo bate need to fast drainage, slope inward from the door to make the door area is always dry. 3. Toilet seat direction: The toilet seat should not be placed facing the bathroom door or towards the north. 4. Bathroom decorating: You should use tiles or stones to floor stereo bate and wall and use light colors such as pale yellow. For the ceiling, you should use a cement plaster ceilings, brightly painted or paved with light-colored moisture resistant materials such as white painted moisture resistant plaster. According to Feng Shui, Bathrooms are the properties of water, so it is best to select the color properties of water, such as white or the color properties of metal such as black or blue. Those colors are not only elegant but also give you a sense of quiet. You should not use too bright colors such as dark red. 5. Also very good if you use plants to decorate your bathroom: You should select plants resistant to high humidity with lush leaves throughout the year. Upon entering the bathroom, we like to throw away all the sorrow in their daily lives. Thus, bathroom is really a quiet, comfortable place to give you a sense of relief and the most enjoyable. To get a bathroom like that, you need to have a design in line with Feng Shui. Bathroom area is usually smaller than other rooms, so if the arrangement is not reasonable you will not get a perfect bathroom. Therefore, the design according to Feng Shui for the bathroom should be respected.